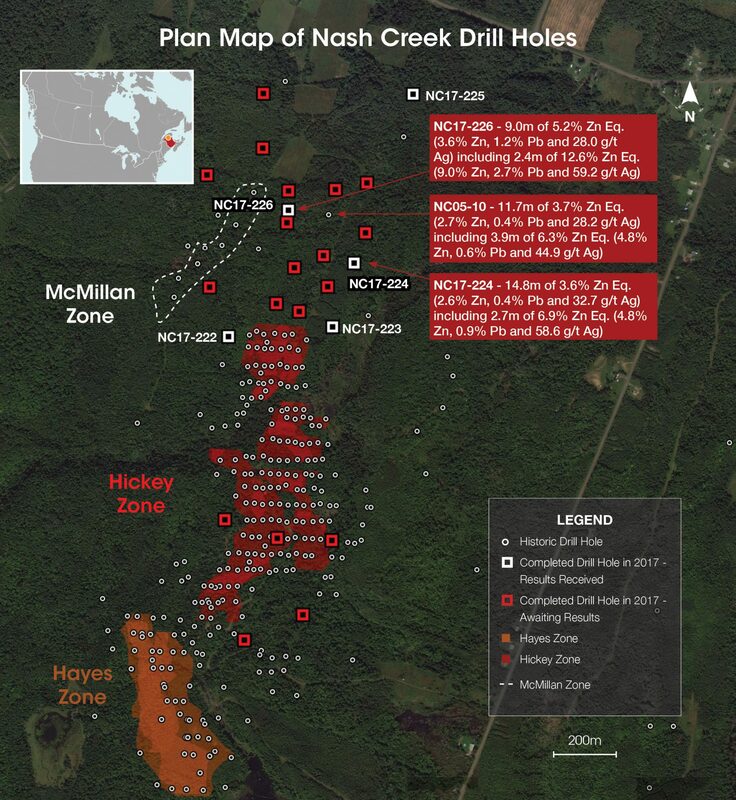 Callinex Intersects 9.0m of 5.2% Zinc Equivalent Mineralization at 11m Depth Located 350m North of the Nash Creek Deposit in New Brunswick - Callinex Mines Inc.
An additional ten holes were drilled within a 450m long by 200m wide target area to the north of the Nash Creek Deposit. Vancouver, British Columbia – July 13, 2017 – Callinex Mines Inc. (the “Company” or “Callinex”) (TSX-V: CNX; OTCQX: CLLXF) is pleased to announce assays results from the first five holes drilled at the Company’s 100% owned Nash Creek Project (the “Project”) in the Bathurst Mining District of New Brunswick (See Figure 1). Drill hole NC17-226, located 350m north of the Nash Creek Deposit, intersected 9.0m of 5.2% zinc equivalent mineralization (“Zn Eq.”) (3.6% Zn, 1.2% Pb and 28.0 g/t Ag) including 2.4m of 12.6% Zn Eq. (9.0% Zn, 2.7% Pb and 59.2 g/t Ag starting at a depth of 11.0m (See Table 1 and Figure 2). Additionally, drill hole NC17-224, located 250m northeast of the Nash Creek Deposit, intersected 14.8m of 3.6% Zn Eq. (2.6% Zn, 0.4% Pb and 32.7 g/t Ag) including 2.7m of 6.9% Zn Eq. (4.8% Zn, 0.9% Pb and 58.6 g/t Ag) starting at a depth of 77.0m. These drill holes are located in an area that is largely untested and the deposit remains open for further expansion. Drill holes NC17-226 and NC17-224 indicate potential for mineralization located closer to surface with higher grades as compared to the northern extent of the Hickey Zone to the south (See Figures 2 and 3). Additionally, NC17-226 encountered extensive zinc mineralization with 43 samples that exceeded 1% Zn Eq. before the hole ended in mineralization grading 1.2% Zn (See Figure 4). After completion of these two holes an additional ten widely-spaced holes were completed to conduct a first pass evaluation over a 450m long by 200m wide area (See Figure 2). The near-surface mineral resource estimate for the Nash Creek Deposit includes an Indicated resource of 9.0 Mt grading 3.6% Zn Eq. totaling 712 M lbs of Zn Eq. mineralization and an Inferred resource of 1.1 Mt grading 3.6% Zn Eq. totaling 88M lbs of Zn Eq. mineralization over a 1.5km strike length with an average lateral extent ranging from 100 to 300m (See Table 2 and Figure 2). The Nash Creek Project is ideally situated approximately 1 km south of Provincial Highway 11 and has access to power supplied by a nearby 450 MW power station. Additionally, the Project is located 100 km by road to Trevali’s Caribou Mine and 25 km by road to Glencore’s Belledune lead/silver smelter, which has direct railway access to Glencore’s Canadian zinc smelting and refining operations. Mineralization at the Nash Creek Deposit is hosted in both felsic and mafic units, with porosity and structure (specifically faults/fracture zones) being the key features that control the extent and distribution of the mineralization. Zinc mineralization is hosted in a low iron sphalerite that is difficult to visually estimate and lead mineralization is hosted in galena. The mineralized envelopes (lens) are sub-horizontal and appear to cross-cut the shallow east dipping lithological stratigraphy. Four distinct envelopes of mineralization make up the defined resource of the Hickey Zone. 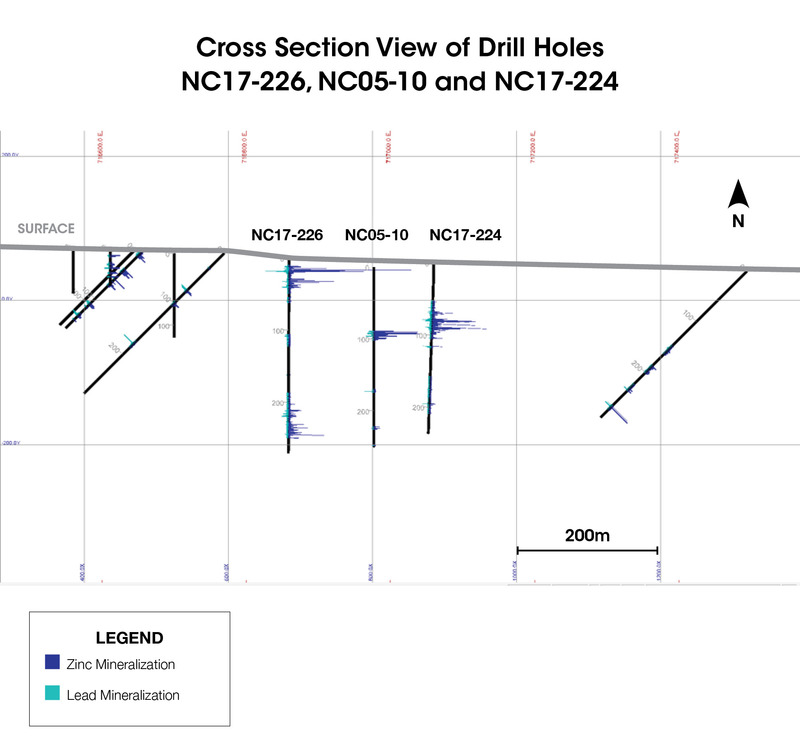 Drill hole NC17-226 intersected a fifth potential envelope between 241.7m- 246.0m (See Figure 4). The hole was drilled to a greater depth than previous drilling in the area and further work will be required to evaluate the significance of this fifth potential envelope. Based on preliminary test results, the current resource grade of 3.6% Zn Eq. could be upgraded with the use of dense media separation (“DMS”) to a head grade of 5-7% Zn Eq. (See News Release dated September 12, 2016). DMS is a well established density separation process that rejects lower specific gravity (“SG”) material, such as internal dilution, before it is transported to a concentrator. Over 6,000 density measurements collected from Nash Creek drill core have demonstrated a correlation between higher grades and a higher SG. DMS testing has particular promise for the Project by removing internal dilution that tends to ‘sandwich’ relatively higher grade zones. 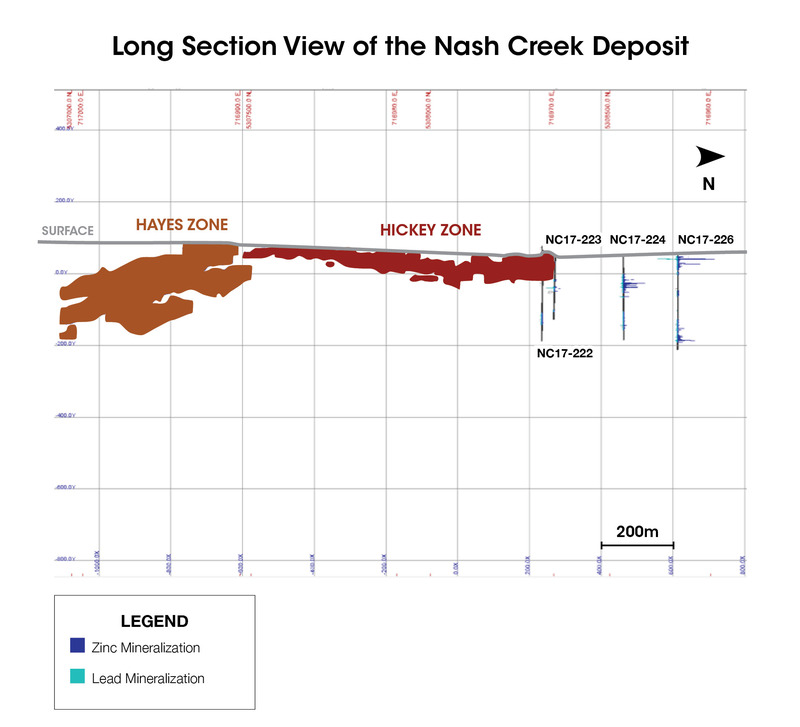 Additional metallurgical testing has indicated that the Nash Creek Deposit is amenable to conventional flotation techniques with recoveries of 91% for zinc and 82% for lead based on a coarse grind size. This test work produced a zinc concentrate grading up to 64% Zn and a lead concentrate of approximately 50% Pb. The Nash Creek phase of the 2017 drilling campaign included 24 holes totaling 4,622m. Samples from four additional holes have been shipped to the lab for analysis while an additional 10 holes are being prepared for shipment. Callinex anticipates additional results to be released over the next 60 days. Jason Levers, P.Geo, a qualified person under National Instrument 43-101 and a Staff Geologist for Callinex, has reviewed and approved the technical information in this news release. Zinc equivalent grades are based on the following metal prices: zinc US$2,525/t (1.15/lb), lead US$2,205/t (1.00/lb), and silver US$18.0 per oz. Metal recoveries of 100% were applied in the metal equivalent calculations. The zinc equivalent calculation is as follows: ZnEq = 100 ((Ag Price in (g) x Ag Grade) + (Pb Price*2204.6 x Pb Grade(%)/100) + (Zn Price*2204.6 x (Zn Grade(%)/100))/Zn Price*2204.6). The numbers may not add due to rounding. True widths are not currently known. Estimation and reporting of the mineral resource estimate adheres to NI 43-101 guidelines and CIM Definition Standards. Eq. is calculated using three-year trailing metal prices of $0.90/lb Zn, $0.87/lb Pb and $17.73/oz Ag, and recoveries of 90.5% Zn, 81.5% Pb and 50% Ag based on preliminary results from metallurgical testing. Mineralization was constrained using a 2.00% Zn. Eq. wireframe, and segmented in 16 domains in the Hickey Zone, and 5 domains in the Hayes Zone. The cut-off grade for the mineral resource estimate is 2.00% Zn. Eq. which is considered suitable for reporting mineral resources for a potential open pit project and depth of mineralization. The estimate is not constrained by a conceptual pit. Densities vary by grade and rock type with an average specific gravity of 2.84 for the Hayes Deposit and of 2.82 for the Hickey Deposit. The mineral resource estimate was calculated using an ordinary kriging (OK) methodology. The block model was constructed with block dimensions of 5 x 5 x 5 meters. Mineral resources that are not mineral reserves and have not been demonstrated to have economic viability for extraction. The quantity and grade of reported inferred resources in this estimation are uncertain in nature and there has been insufficient exploration to define these Inferred resources as an indicated or measured mineral resource.It is uncertain if further exploration will result in upgrading them to an indicated or measured mineral resource category. Individual samples were labeled, placed in plastic sample bags, and sealed. Groups of samples were then placed in security sealed bags and shipped directly to SGS Canada Inc in Vancouver, B.C. for analysis. Samples were crushed to 75% passing 2mm and pulverized to 85% passing 75 microns in order produce a 250g split. All copper, zinc and silver assays were determined by Aqua Regia digestion with a combination of ICP-MS and ICP-AES finish, with overlimits (>100 ppm Ag, >10,000 ppm Zn, and >10,000 ppm Cu) completed by fire assay with gravimetric finish (Ag) or Aqua Regia digestion with ICP-AES finish (copper and zinc). All samples were analyzed for gold by Fire Assay of a 30 gram charge by AAS, or if over 10.0 g/t were re-assayed and completed with a gravimetric finish. QA/QC included the insertion and continual monitoring of numerous standards and blanks into the sample stream at a frequency of 1 per 10 samples, and the collection of duplicate samples at random intervals within each batch at a frequency of 1 per 10 samples. SGS Canada Inc carried out some or all of following methods to obtain the assay results for Callinex: G_LOG02 Pre-preparation processing, G_WGH79 Weighing and reporting, G_PRP89 Weigh, dry, crush, split, pulverize, G_SCRQC QC for crush and pulverize stages, G_CRU22 Crush >3kg, G_DRY11 Dry samples, GE_FAA313 @Au, FAS, AAS, 30g-5ml (Final mode), GE-IC14A Aqua Regia digestion/ICP-AES finish, GE_IMS14B Aqua Regia digestion/ICP-MS package, GE_IMS14 Aqua Regia digestion, GO_FAG303 30g, Fire assay, gravimetric finish (Au)(Final Mode), GO_FAG313 30g, Fire assay, gravimetric finish (Ag)(Final Mode), G0_ICP13B Ore Grade, Aqua Regia digest/ICP-AES. Ag >10ppm was analyzed by ICP and GO_XRF77B-pyrosulfate fusion. Callinex Mines Inc. is focused on discovering and developing zinc and copper rich mines within prolific Canadian VMS mining jurisdictions. The Company is actively exploring its Pine Bay Project, located in the Flin Flon mining district of Manitoba, which hosts significant historic VMS deposits that are within close proximity to a processing facility. 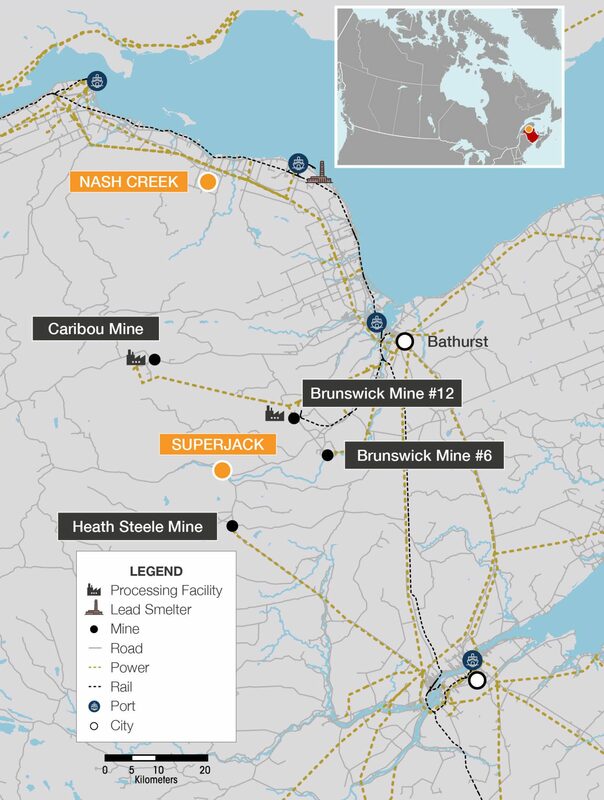 The larger project portfolio hosts three significant zinc rich mineral resources including the Point Leamington, Nash Creek and Superjack Projects located in Eastern Canada.